Based on research during and immediately following World War 2, this pathbreaking book analyzed the proclivities individuals might have toward support for authoritarian regimes, stressing preconceived attitudes on race, class, sexuality and nationalism, concluding that fascism’s attraction came not (or not just) from political agreement but from a personality structured by larger, repressive social forces in which sociological influences upon ideology are mediated. By Theodor Adorno et. al. • There is too much emphasis in college on intellectual and theoretical topics, not enough emphasis on practical matters and on the homely virtues of living. • Homosexuality is a particularly rotten form of delinquency and ought to be severely punished. • Human nature being what it is, there will always be war and conflict. • There are some things too intimate or personal to talk about even with one’s closest friends. • There are some activities so flagrantly un-American that, when responsible officials won’t take the proper steps, the wide-awake citizen should take the law into his own hands. • No insult to our honor should ever go unpunished. • Every person should have a deep faith in some supernatural force higher than himself to which he gives total allegiance and whose decisions he does not question. What Adorno, Frenkel-Brunswik, Levinson and Sanford were looking for in such questions was not a conscious, well-formulated fascist politics among their interview subjects. Rather, they were trying to pinpoint an underlying set of pre-political personality traits that formed the wellsprings of fascist support. A few of the traits on their list may seem dated in the 21st century — for instance, the “exaggerated concern with sexual goings-on” may no longer apply following the transformation of Western cultures by consumerism, feminism, and the LGBTQ movements. Be that as it may, it is precisely the hunt for an underlying fascist personality that makes this book so valuable at the present conjuncture. I have argued elsewhere that Donald Trump puts forth an essentially fascist rhetoric and appeals to fascist sensibilities, but he doesn’t command a fascist party, and it’s unclear whether he needs a fascist state to achieve his goals. From what we have learned from Tony Schwartz — ghost writer of Art of the Deal — Trump simply doesn’t read. (3) With no functional knowledge of history to draw upon, his rediscovery of fascist rhetoric rather derives from his particular personality structure, and it appeals to others with the same. The United States may or may not develop a fascist regime after January 20, 2017, but having its institutions under the command of someone with this personality represents an unprecedented danger. Like most postwar, left and liberal antifascist studies, The Authoritarian Personality assumed that the threat of fascism did not die in 1945, but remained a latent potential in all Western societies. The book appeared at a moment of great anxiety for the American left. In the early 1950s, what people to the left read as “fascism” in the rise of Joseph McCarthy and the House Committee on Un-American Activities (HUAC) was an onslaught of xenophobia, conspiracy rhetoric and racism along with a very real erosion of civil liberties in the name of anticommunism. Many leftists and even some liberals read this repression in the context of a larger, postwar social transformation that bore uncanny similarities to the very regimes they fought against in World War II: the permanent militarization of society necessitated by the Cold War; a growing anti-intellectualism, cultural homogenization and conformity; a violent, racial reaction against the nascent civil rights movement; and perhaps most dramatically, the rehabilitation of Germany, Spain and Japan as “bulwarks against communism” coupled with a disturbing silence about their recent victims (notably the millions murdered in the Nazi holocaust). Later version of the book. The book’s contributors tried to find the link between fascism and broader social attitudes by correlating the F Scale with other quantified indexes. These related scales underscore its attempt to conceptually aggregate race, class, sexuality and nationalism. They interlocked the “AS Scale” for anti-Semitism; the “PEC Scale” for Politico-Economic Conservatism (largely based on the subjects’ class attitudes); and the “E Scale” for ethnocentrism, which had a number of subscales: the “N Scale” for attitudes toward “Negroes,” an “M Scale” for minorities in general, and a “P Scale” for patriotism (by which they meant a kind of blind, exclusionary nationalism). The foundation of their argument was that the personality is a structure, largely formed in childhood, which determines ideological preferences. It is formed through the impact of a larger, social environment, which it in turn reproduces and modifies — in other words, personality is determined by larger social forces, but not entirely; it also actively shapes those larger forces. 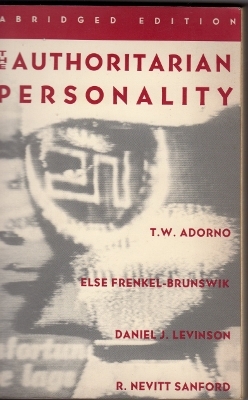 For Adorno and his associates, the concept of “personality” was the key to connecting distinct social phenomena; this frame was likewise integral to unlocking the mystery of how individuals combined all manner of divergent politics — laissez faire capitalism, racism, patriarchy, homophobia — into an integrated worldview. Additionally, he found that the authoritarian personality views all groups as static, stereotypical and internally homogenous (thinking in terms of stereotypes is easier — it saves mental energy). Consequently, Mack could only speak of his ingroup (the Irish) in positive terms, and saw outgroups as weak, corrupt, and out to control his own. Unlike conservatives who understand how capitalism functions and defend its class structures accordingly, the pseudoconservative suffers from a failed identification with established structures and would destroy the very institutions he sought to defend. The pseudoconservative type — which Adorno found to be a very common phenomenon on the American right — is characterized by a rebelliousness that is ultimately subservient to authority. The authors of The Authoritarian Personality argued that this quality arose from a veiled resentment toward the patriarch of the family. His or her total inability to critique the patriarch (that develops into an inability to critique any ingroup authorities), leads to a projection of rebellious, resentful impulses onto some outgroup. All repressed and unutterable animosities toward the overbearing father, for example, could be projected onto the Jews — or onto the people of another nation — who become an all-powerful, all-controlling force that must be stopped. Adorno extended this connection between ethnocentrism, patriarchy and nationalism to capitalism, by theorizing the pseudoconservative’s rebellious energies toward political leadership. Applying this conception to our time, movements of the right — from the Goldwater campaign to the Tea Party — are “rebellions” ultimately submissive to authority because their members know that private-sector employers, not the government, are the real forces in control of daily life. Their left-leaning nemeses thus appear as “usurpers” of true authority whose constraints upon rightful leadership must be abolished. They may rail against the King, in other words, but never the Crown. Such a perspective is particularly useful to interpreting the political right in the United States, with its close relationship to capitalism. Popular Front antifascism of the 1930s clearly informs The Authoritarian Personality, though the work also reflects the evolving nature of antifascist thought in the 1950s. One continuity with the 1930s was its premise that capitalism ultimately determines whether the authoritarian personality will have a chance to violently assert itself. In the two decades following the study’s publication, “the authoritarian personality” was a phrase deeply embedded in antifascist vocabulary. The book was also quite well received by reviewers in both academic and popular periodicals, its success inspiring a flood of studies on the political right within the academy. This wave culminated in the collection The New American Right in 1955 (expanded and re-published as The Radical Right in 1963), in which future neoconservatives Daniel Bell and Nathan Glazer, as well as David Riesman, also drew upon the experience of fascism as a way of explaining the American right. (11) It was followed in 1960 by Seymour Martin Lipset’s landmark book Political Man: the Social Bases of Politics, which explicitly discussed McCarthy’s social base as the U.S. incarnation of Nazism. The Authoritarian Personality does have real limitations. First and foremost, it doesn’t adequately account for the social positions of individuals in their study. For instance, people of color may also be high scorers on the F Scale (susceptibility to fascism), yet the authors have little explanation for why these very same people of color tend not to support reactionary politics. Such undeveloped insights do hold out hope. If fascism is deeply rooted in your personality structure, there isn’t much hope once it’s taken root — and this is in fact their conclusion too. They found more hope in weaning the “middle-scorers” away from authoritarianism. In general, their solutions include more open, anti-authoritarian parenting, developing psychoanalysis for mass-scale use (since people who lack introspection are the least able to see how the world is made), and of course creating a less repressive social order so that the authoritarian personality has far less fuel. But from an organizer’s standpoint, if UE and ILWU workers rejected far-right politics despite having authoritarian tendencies, we could also add that creating institutions of solidarity — ones that hammer home anti-hierarchical worldviews on a regular basis, and in the realm of daily life, just as the ILWU and the UE did — are critical for keeping the fascists at bay. Alas, in the present devastated state of organized labor such hopes seem far-fetched for the immediate future. Perhaps more hopeful for the long-term is their conclusion that, unlike proto-fascists, anti-authoritarians experience genuine pleasure, and are in general happier than authoritarians. Followers of French political theorist Michel Foucault would no doubt scoff at such a conclusion, since it reeks of the “repressive hypothesis” that Foucault worked against — the notion that power works mainly through repression, when in actuality, he maintained, it works by affirming individuals and speaking to their desires. But if anything, The Authoritarian Personality shows us that some of those old-school believers in repression developed a very complex dialectic between repression and desire, since even the authoritarian tries to actively (if unsuccessfully) fulfill wants and needs from his or her worldviews. If anything, the present moment suggests that the elements of the left, fueled in part by Foucault, have taken their eyes off of unfulfilled desire and of repression — psychological and otherwise — as a basis of reactionary politics. 1. Theodor Adorno et. al. The Authoritarian Personality (New York: Norton, 1982), 155-56. 4. Rolf Wiggershaus, The Frankfurt School: Its History, Theories, and Political Significance (Cambridge: MIT Press, 1995), 411. 6. The Authoritarian Personality, 22-23. 9. For a discussion of Adorno’s writings on pseudoconservatism, see Wiggershaus, Frankfurt School, 419-20. Quote on 419. 10. Adorno, The Authoritarian Personality, 7. 11. On The Authoritarian Personality and the academy, see William Hixon Jr., The Search for the American Right Wing: An Analysis of the Social Science Record (Princeton: Princeton University Press, 1992), xii. For a sampling of positive reviews, see Christian Century, April 26, 1950, 532; New York Herald Tribune, May 7, 1950, 23; American Political Science Review 44 (1950), 1005. In The New American Right, the essays by Lipset and Viereck firmly reproduce the totalitarianism conflation. 12. For an explanation of standpoint theory, which Jameson derives from Lukacs, see Vaughn Rasberry, Race and the Totalitarian Century: Geopolitics in the Black Literary Imagination (Cambridge, MA: Harvard UP, 2016), 68. 13. The Authoritarian Personality, 197.